Join us and start planning your next trip to the race today! Guide to the 24 Hours of Le Mans! Join us and start planning your next trip today! please find attached the invitation to the 2019 Beermountain Annual Member's Meeting. 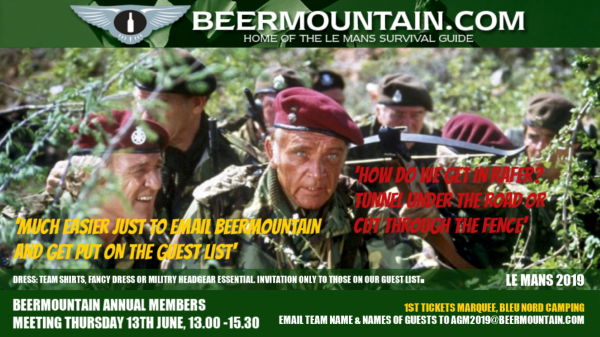 The Beermountain Annual Member's meeting is the perfect opportunity to meet up with old Le Mans friends and to meet new ones too. The meeting celebrates all things Beermountain and also has a small element of raising money for good causes, more details to follow! Many teams will attend in costumes and there will be an award for the best dressed team. If not attending in costume please wear, if you have them, your team shirts and we do like to see hats worn. Number in your group, real names or nicknames of each potential attendee, your team/group name and your real name. Please also state if you have attended before and if this is to be your first time please let us know how you heard about the meeting and if you know any members. If your plans change and you need to cancel please email us, also if you need to amend you list of attendees please contact us. The guest list does fill fast and we do appreciate you letting us know of any changes. Please arrive on time. The gate will be staffed by some of our members from just before 13.00 until 13.30. When you arrive please give them your team name and member's names. If you arrive after 13.30 our members may be inside enjoying themselves and the gate will have a real security officer on duty! They will not let you in unless you are staying on the 1st tickets site and have one of their passes. You could try asking them to fetch one of us from inside to vouch for you but this may incur a beer forfeit! When in the 1st Tickets enclosure please respect their hospitality, their staff and guests. Do not bring your own food or drinks with you. Brian and his team have a wonderful bar. Please leave promptly, the site receives a lot of new guests in the afternoon and we need to vacate it directly after the end of the meeting. There is no car parking within the enclosure but they do allow for bicycles to be brought in. They are left at your risk and on that note Beermountain and 1st Tickets takes no responsibility for your possessions. Have fun, be merry and be safe. The 2019 Beermountain Annual Members Meeting is being planned now. Please keep listening here and on our social media channels for more details. Everything you need to know about your campsite..